AC turned 1 Tuesday (7-25), and we celebrated Saturday. 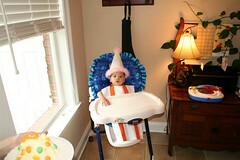 She's not a big fan of sweets, but she enjoyed all the family being around. Some more pictures are here. AC is beautiful! Sharon showed me some pictures from last weekend yesterday. SG was saying her name when we talked about her as well. Absorb all of this time into your heart and mind. This age goes by so quickly. Congrats on your new addition to the family!